We had a great group of people for the 2nd ever Endurance 101 Clinic near Adrian, OR.. There are few things in this world more gratifying than making new friends, sharing knowledge, spending time with old friends, riding horses and eating calorific food! How can you beat that?! 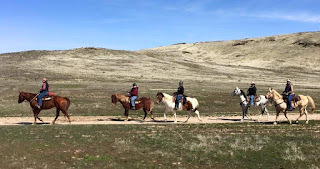 We had sun, wind, bugs but we managed to do our "classroom" stuff where we chatted about what endurance rides are, clubs and organizations, feeding, conditioning, pacing, managing your horse and a whole lot more. Then I shared my contents of a crew bag that would be handy at the vet check. Then we hid from the wind and had lunch. I shared easyboot information with Amy Heward. Shoulda got a pic of that! Oh darn we should have gotten a pic of a lot of things but we were just busy.